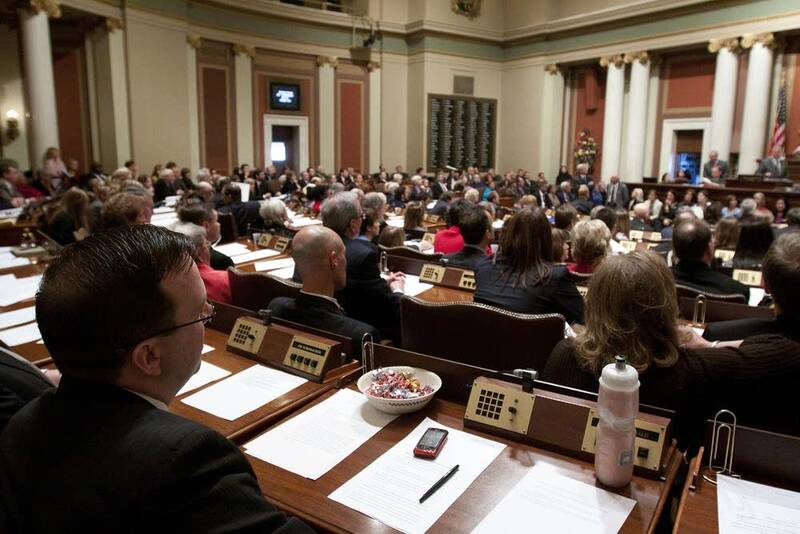 As the critical 2012 presidential election year approaches, the Minnesota Republican Party is in disarray, trying to unravel the after-effects of the 2010 election, which saw the GOP capture the Legislature but lose the governor's race. Minnesota Republicans will hold an election in a month or so to replace former Chairman Tony Sutton, who abruptly resigned Friday amid internal criticism of the party's finances. At the party's State Central Committee meeting on Saturday, about 350 delegates learned sobering news. The party lost a third of its staff, including Executive Director Ryan Griffin, to budget cuts. It is also $581,000 in debt. In addition, Republicans are increasingly divided over the future of the party, a debate that may seem minor to outsiders, but could affect how the party fares next year. Michael Brodkorb, who left his post as deputy chairman in October to help run a congressional campaign, said party activists should focus on electing candidates who can win in November. "If we're shortsighted and only focus on electing ideological purists that can't win the general election, we're not serving our party," he said. "At the end of the day, we need to win elections. And ultimately nominating the Bill Buckner of Republican politics was probably not, in retrospect, the smartest idea." Brodkorb was referring to Tom Emmer, the Republican nominee for governor in 2010. Brodkorb, who blames Emmer and his staff for the party's financial problems, said Emmer's campaign made it difficult for the party to raise money. He also said the recount in the governor's race added to the party's financial problems. Emmer and his campaign weren't prepared to win, said Brodkorb, who said Emmer was not able to capitalize on his nomination win. "It's like someone winning the lottery who suddenly thinks he's good at business," he said. Emmer could not be reached for comment, but his former campaign manager, David Fitzsimmons, argues that Emmer ran a good campaign. Fitzimmons said Emmer faced strong headwinds that included Democrat Mark Dayton's high name recognition and millions spent on Dayton's behalf by DFL interests. He said Brodkorb, who serves as spokesman for the Senate Republican Caucus, may face similar challenges in 2012. "Gov. Dayton's ex-wife has said, 'Now that I got Gov. Dayton the governorship, I'm going to get him the Legislature,' " Fitzsimmons said, a reference to Alida Rockefeller Messinger, who contributed heavily to an outside group that worked to help elect Dayton. It's unusual for a Republican insider like Brodkorb to publically criticize the party's nominee. But his comments highlight the divisions within the party that the next chairman will have to try to heal. Another challenge for the next GOP leader will be to help find a strong opponent for popular DFL incumbent Sen. Amy Klobuchar in less than one year. The new chairman also will have to make key decisions about the presidential contest and state legislative campaigns. Kelly Fenton, who delegates elected the party's deputy chairwoman on Saturday, said she things Republicans will mend the breach and make a strong showing next fall. "We've done a great job balancing it already because we do have the majority in the House and the Senate," Fenton said. "There are a lot of voices within our party and all voices are welcome. I think we already did a great job of balancing it and we'll continue in that pattern." Republican National Committeeman Jeff Johnson said he intends to help the Minnesota GOP raise money until it elects a new chairman. He also downplayed any concerns that Republicans may be at a disadvantage in 2012, with polls showing President Obama dropping in popularity. "Based upon the way things are going in the country right now, that is going to help us tremendously regardless of how organized we are," Johnson said. But Johnson said Republican success in Minnesota will depend on how well the party raises money. Over the weekend, U.S. Rep. John Kline urged party members to come together. He told reporters after his speech that he wasn't too worried about the party's problems. He said his campaign, and many others, are already organizing for 2012.